In a delicious turn of fate Elon Musk has put robots the world over on notice. He recently replaced the highly-touted automation system at Tesla with a better, more intelligent paradigm: humans. Tesla’s Model 3 production facility is regarded as one of the most advanced car manufacturing plants in the world. It’s also been a complete failure. Elon Musk this month personally took over operations. And in true Musk form he’s burning the candle at both ends, rarely leaving the building. When your billionaire boss is sleeping on the factory floor, it’s safe to say there are going to be some company changes. Thanks to a series of unfortunate events, Tesla’s 2018 has been one of those no good, awful, very bad years. A second Autopilot-related fatality put a damper on public opinion, while missing every production goal the company set made shareholders nervous. And to top things off, Tesla had to recall over 100,000 Model S cars due to some bolts in the steering column using ill-suited materials. We mentioned before that most (if not all) of the company’s problems are due to human error. The only consistent thing about its Model 3 production has been the company’s failure to meet its fulfillment goals. And that’s because Musk chose to make the ‘last mile’ of production entirely automated, and it blew up in his face. After changing things at the factory recently, and replacing the expensive automation with good old fashioned human workers, things are looking up. Musk told King he expected to push 2000 units a week and increase those numbers through the second quarter and beyond. So, it turns out the world’s most advanced automobile factory, helmed by one of the most tech-savvy people in the world, can’t finish its job using automation. 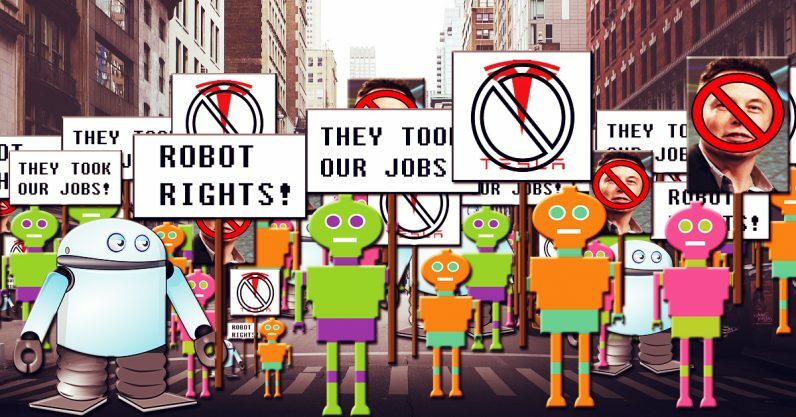 And, if even Tesla can’t keep robots employed, it looks like humans are going to have to put off our eventual retirement from the global workforce even longer.